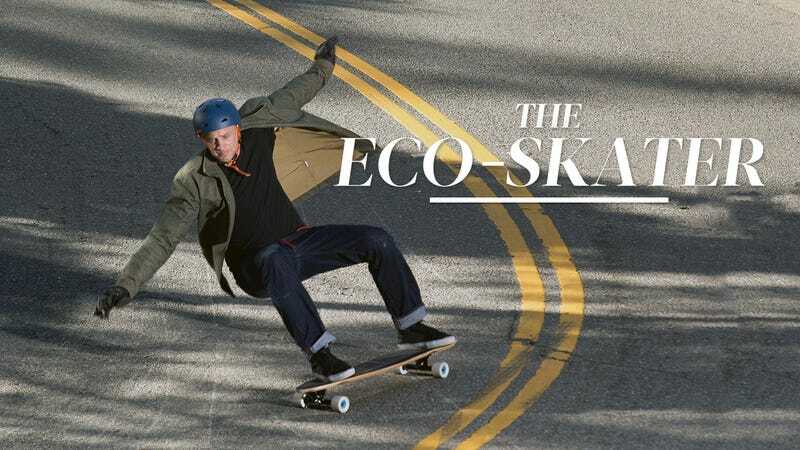 It was 1996 when Bay Area skateboarder Jason Salfi, in the early stages of starting up Comet Skateboards with a group of friends, found himself flipping through the phone book, looking for board-making materials that wouldn’t shred the environment. The guys didn’t want to just slap something together; they wanted to take a more eco-conscious approach. The team started out by dissecting the modern skateboard. When they did, they learned it was basically a “toxic sandwich” of oil-based lacquers, spray-paint coating, and glue. Salfi says it was the “good old Yellow Pages” that led him to EcoTimber. “It turned out to be a wonderful place to source wood,” he says. “It was amazing to obtain sustainably harvested woods, right there locally in the Bay Area.” And with that, Comet Skateboards was born. Salfi got hooked on skating at a young age. When he was just seven years old, with nothing but a plastic toy board, he taught himself how to “carve and gyrate” to generate speed. Soon his buddies got into skating, and they rapidly got better, even knocking out the big hill by his house. “I bombed it and cut the wobbles. I ate it and got road rash — but man, was that fun,” Salfi remembers. That change manifested itself in the form of both political and product awareness (i.e., being conscientious about what he purchased). “As kids we took on some severe environmental issues and wrote letters to local representatives,” he says. When he grew older, Salfi piloted sailboats around the Pacific and Caribbean, and even restored old boats in San Francisco — basically just to make enough cash to skate and surf. While he had some magical experiences, he always felt like he was missing something. That’s when he decided to combine his skills and interests into one career: improving the boards skaters ride on, via Comet. It wasn’t an easy process. Salfi and his friends, starting their business entirely from scratch, had to build tools and presses. Finding EcoTimber was their first big breakthrough. Next they turned their attention to a board’s coating and its graphics. “It turns out that these heat-transferred graphics that were going onto every skateboard was just a toxic flurry of really gnarly chemicals,” Salfi says. So they decided to skip the graphics and make blank boards, using water-based coatings and formaldehyde-free glues, and supply them to other big brands in the industry. Soon Comet relocated across the country, to Ithaca, NY, in order to jumpstart a “material-science collaboration” with a soy-based polymer firm there. It was then that Salfi began to realize the impact he was making on the world and on other people, just like his old teacher had encouraged him to do. Kids began reaching out to him, saying that, because of Comet, they were changing their majors to environmental science or sustainable architecture. “Right there it felt like there was a movement with some real juice to it,” he says. Yet the ride hasn’t been 100% smooth since then. In recent years, the company has faced tough decisions about scale and velocity. How do you grow as big as possible while still maintaining the ideal manufacturing environment and keeping employees happy? Once upon a time, Salfi just wanted to skate solo. But now, being on a team means much more to him. He wants to continue to inspire others — and himself — to do meaningful work. “I want to be a part of this ever-growing community for as long as possible,” he says. Luke McCormick is a writer living in Brooklyn. He has written for SPIN, rollingstone.com, and other publications. Top photo by Bryce Kanights.